Anytime we share research about overall conversion rate benchmarks, I give the same caveat – while it’s helpful to understand conversion rates for your peers, the bigger question you must ask yourself is how to improve conversion rates on your own landing pages and in your own funnels. Is there a methodical way to increase conversion? While marketing has tended to be dominated by the marketer with the “golden gut” or the star direct response copywriter, other disciplines in the enterprise – from manufacturing to IT – have developed methodological processes to improve quality and consistency. The MECLABS Conversion Sequence Heuristic is an attempt to bring the same discipline, rigor and sustainable success to the marketing department. It is part of a patented repeatable methodology (patent number 8,155,995) developed by Flint McGlaughlin, Managing Director, MECLABS (parent company of MarketingExperiments), based on years of testing and research of real product and service offers presented to real customers. But since the Conversion Sequence Heuristic helps more new marketers discovering it for the first time every year, it helps to occasionally revisit this fundamental approach to marketing every now and again. Read on for a cursory look at the factors that affect conversion, and if you’d like a more in-depth understanding of how you can apply this heuristic to your own landing pages and marketing efforts, you can take the Landing Page Optimization Online Course. The Conversion Sequence Heuristic is not an equation to solve. Rather, it is a heuristic, or thought tool (i.e., really cool checklist) to use as you work on landing pages and other marketing offers. You can never guarantee conversion, but by making (sometimes subtle) changes to the right areas, you can increase the probability of conversion. This heuristic helps you identify those key areas. The numbers in front of the different elements of the heuristic indicate how much they impact the probability of conversion. All of the elements are not equal. The motivation of the user is the single most important factor affecting conversion. To see why, let me give you a simple example using myself as the customer. I am a huge Pearl Jam fan. If Pearl Jam came to Jacksonville, Fla., I would find a way to be at the concert, even if their ticket selling process, sales funnel and landing page were not optimized. I am highly motivated. 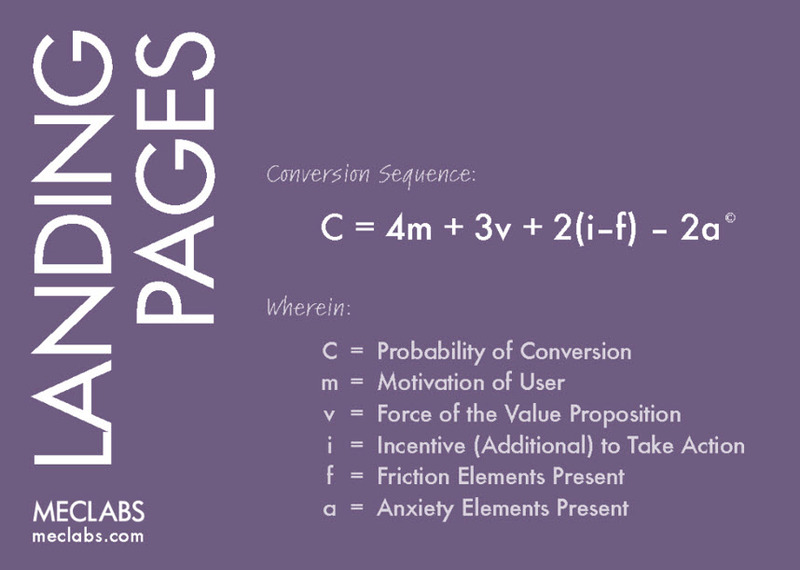 The motivation of the user is also the only element of the Conversion Sequence Heuristic that you cannot change. It is intrinsic in your potential customers. You can, however, gain an understanding of your potential customers’ motivations to better tap into those natural motivations and better serve your ideal customers while improving conversion. Appeal – How much do I desire this offer? Exclusivity – Where else can I get this offer? Credibility – Can I trust your claims? Clarity – What are you actually offering? I like to call incentive the bacon of marketing tactics. Much like how bacon can mask a bad cook’s poor skills and make any meal taste better, the right incentives can make any offer convert at a higher rate. But higher conversion doesn’t always equal success. Just look at the marketing campaigns of some major car companies a few years ago. They were literally paying people ($4,000 cash back … $5,000 … $6,000!) to buy their cars. Not surprisingly, this was not a sustainable, profit-generating business practice and these companies were ultimately bailed out by the federal government. While adding a slight additional incentive can be the necessary extra catalyst to tip the value of your offer to slightly outweigh the cost of your offer, use caution. Incentive can be overdone and mask serious problems with your product’s value proposition or the product itself. Remember, the best marketing campaign is a good product. The conversion process is simply there to communicate the true value of the product and provide the easiest process for the ideal customer to obtain it. Whilewe have discussed the value factors that influence your ideal prospect as they decide whether or not to convert, there are cost factors as well, and these go beyond the actual money spent on a product or service. Friction is one of the cost factors, indicated by the minus sign in front of the letter “f” in the Conversion Sequence Heuristic. Friction is the “aggravation factor” or the hoops the customer must jump through to complete the conversion goal – everything from a lot of form fields to long shopping cart processes to having to register for an account before buying a product. You must remove unnecessary friction, but keep in mind it can never entirely remove friction from a conversion process. By its very nature, when you are asking a customer to take an action – whether a purchase or simply signing up for an email newsletter – there will be friction in the process. Without friction, there would be no action for them to take. Anxiety is the concern ideal prospects have that you might not have a secure checkout process or that your product might not actually deliver on its promises. You can mitigate anxiety with anxiety-reducing elements like security seals, third-party endorsements, customer and expert reviews, and testimonials. Thanks for sharing, I found your comments about appropriate incentives particularly interesting.